They don’t have this ride at Disney World. Does this look like Florida to you? 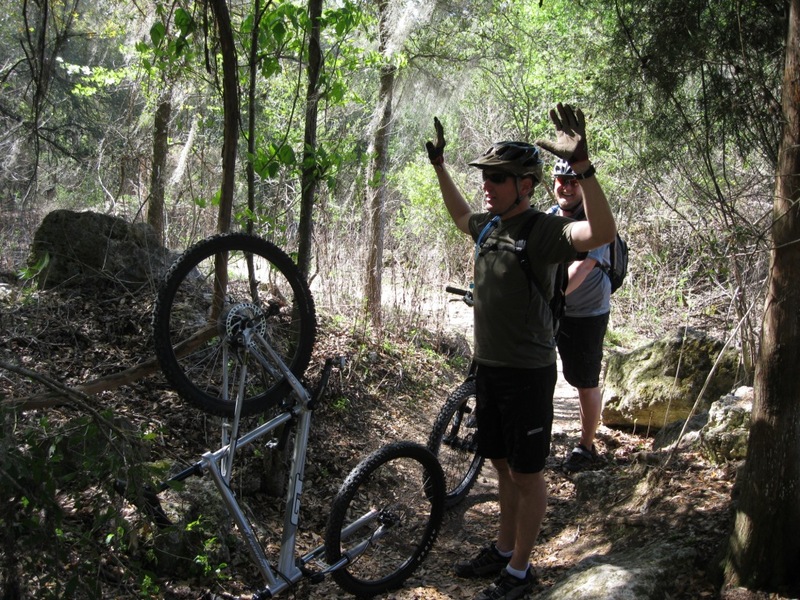 In a state where the largest “mountain” tops out at 344 feet, mountain bikers looking for their fix have to get creative. 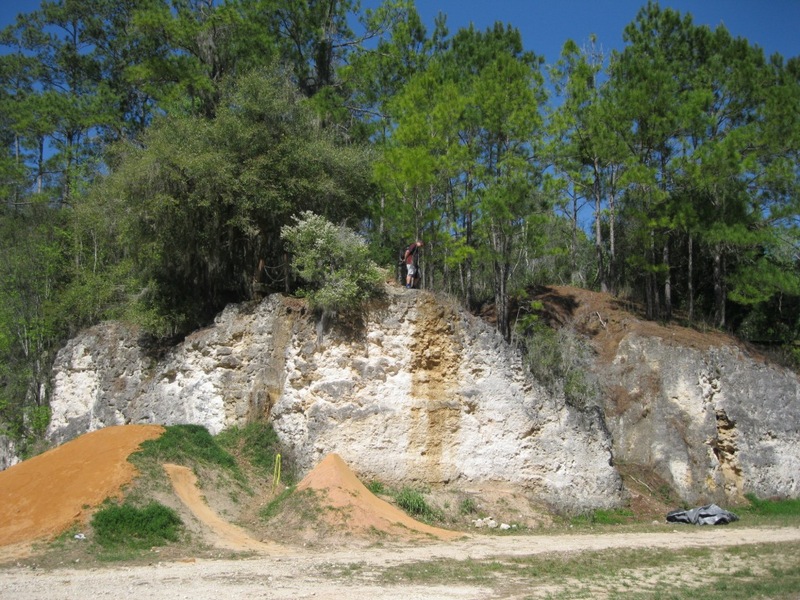 Not to worry; there’s big quarry riding at the Santos and Vortex Area Trails in Ocala, Florida, just northwest of Orlando. 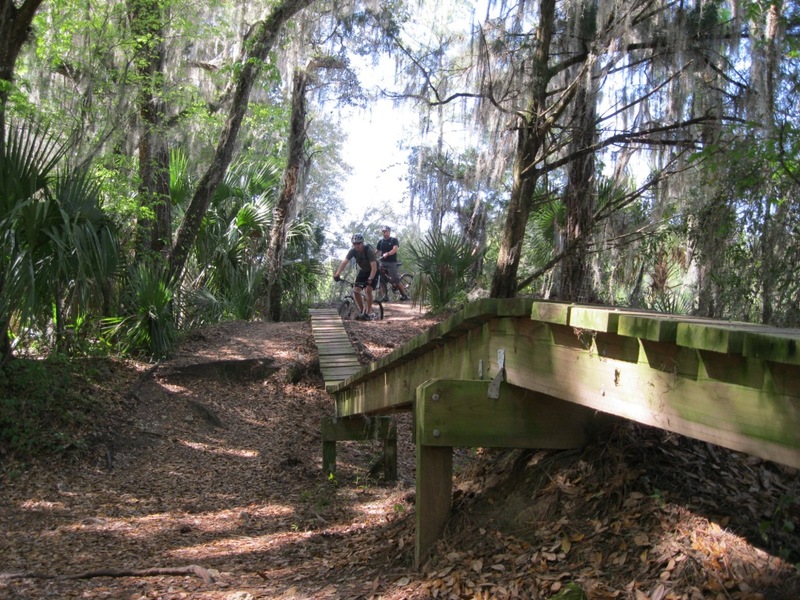 Proving that Florida fun does not require beach or theme park, riders wend their way through subtropical and scrub forest, darting around oak and pine trees, ducking under Spanish moss and charging through thick-fingered palm fronds. 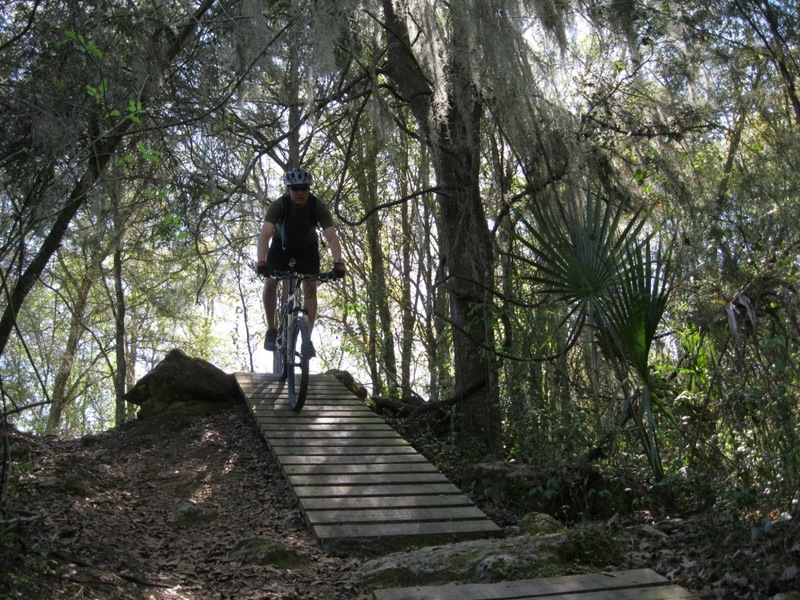 Part of the Marjorie Harris Carr Cross Florida Greenway, these off-road trails are maintained by the Ocala Mountain Bike Association (OMBA) and include beginner, intermediate and expert routes. 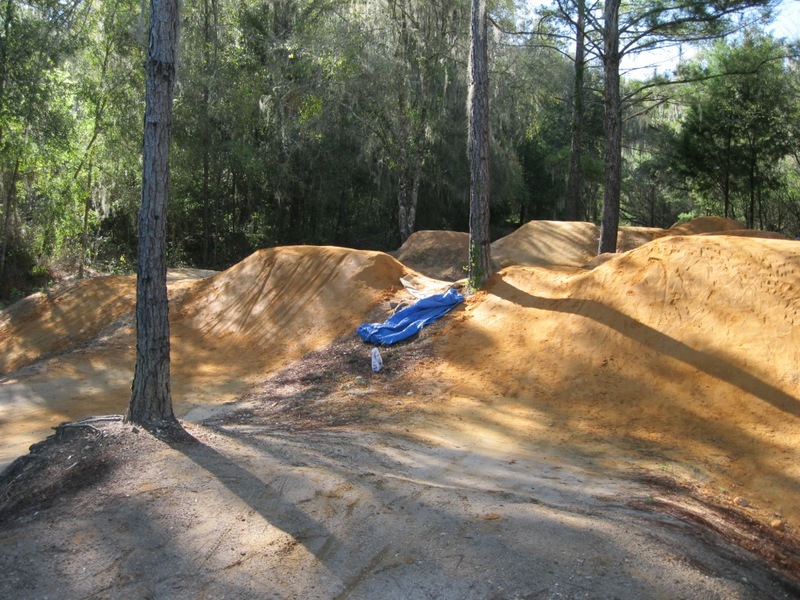 For the big air-inclined, there are dirt jumps and freeride features in the spectator-friendly Vortex area. 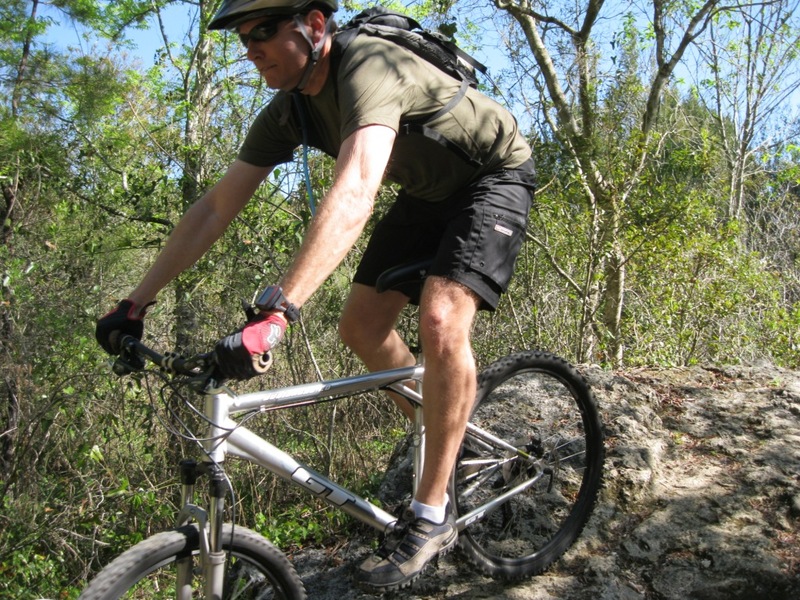 Notables: After the freeride area was completed in 2006, the International Mountain Biking Association (IMBA) gave the Cross Florida Greenway Santos Trail System its premiere “Epic Ride” designation. My ride last Sunday gave me a glimpse of how it earned that award. Jimmy Stewart, Craig Sucich and Glen Johnson at Santos trailhead. The Ride: The pedaling began last Sunday at 10 a.m. in balmy, 70-degree weather—not bad for the middle of March. Beginning at the Santos Trailhead, we warmed up along the low-grade Marshmallow and Canopy trails en route to the Vortex section. 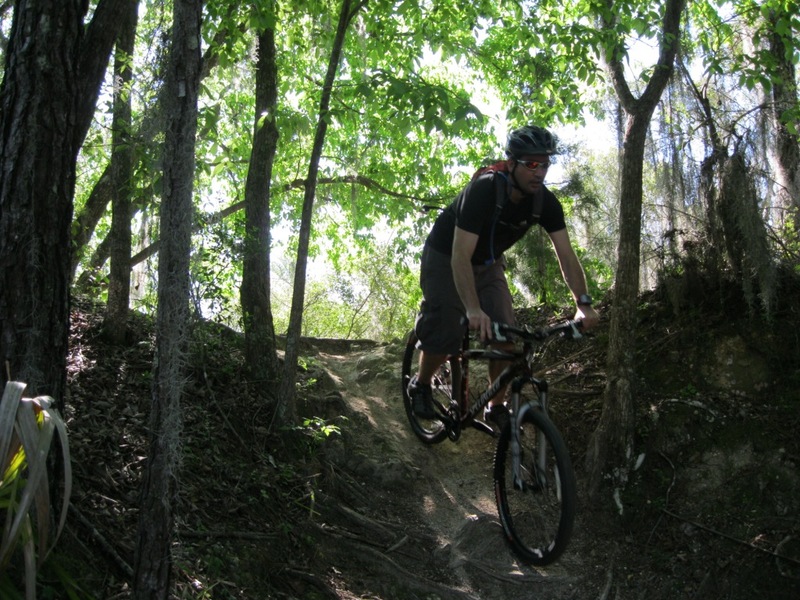 There, we started our workout on the 2.2-mile IMBA Red/Vortex Loop trail, a roller coaster of a ride with short, steep power climbs and quick descents. 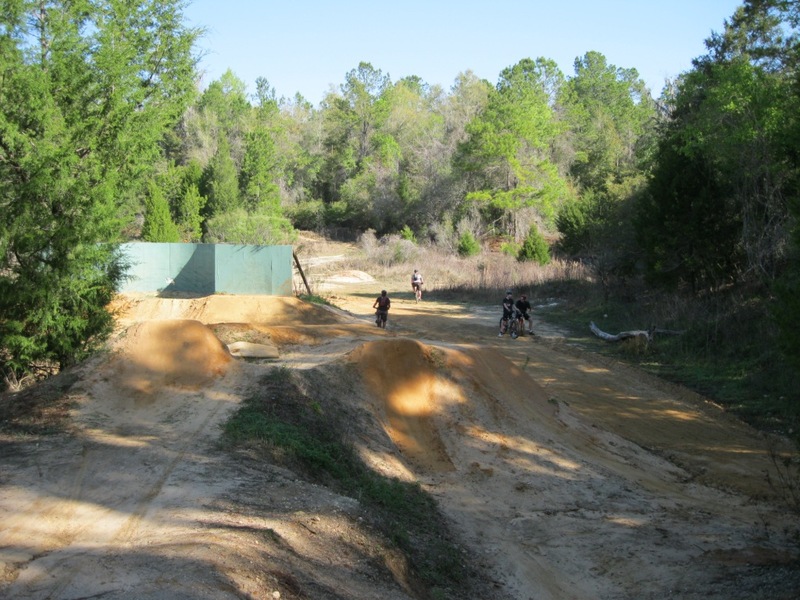 The trail traversed a limestone ridge circling the old quarry, now filled with dirt jumps, pump track and drops both big and small. Progressive jump lines, from table tops to kickers and gaps. Go big or go home? After scoping out the big drop to the left, going home sounds good to the rider above. 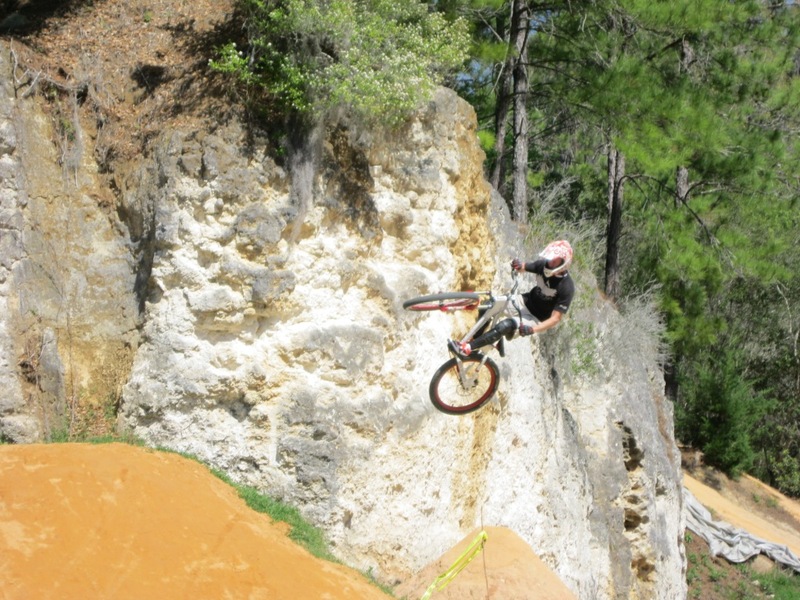 Ladder drops hidden in the forest dump riders into the quarry. Big air opportunities are not the only draw to the Vortex area. 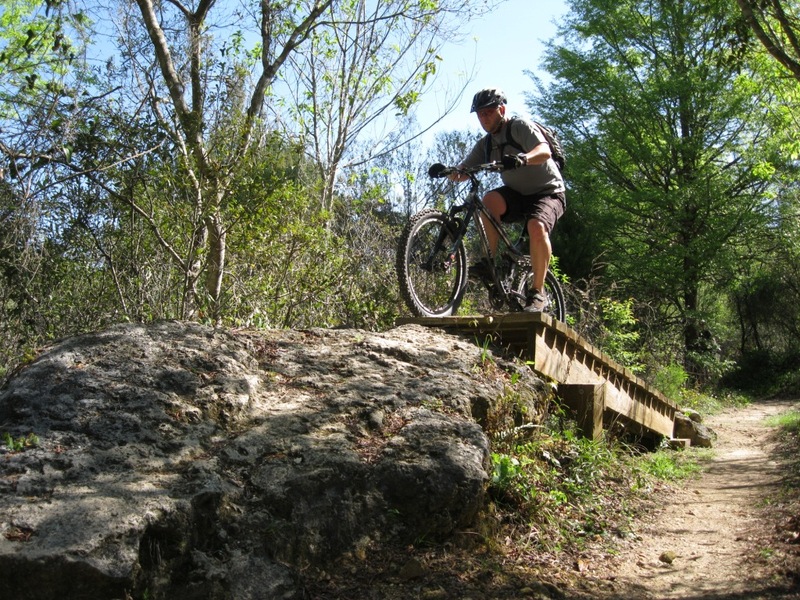 The IMBA Red XC loop, listed as an expert trail, boasts some technical challenges: rock and boulder riding, sharp corners, small drops and ladders. And given the quick elevation changes, this loop makes for great interval training if you put in the lap time. Glen gets a ladder assist to a rock drop. Craig takes the same line on the rock. Long ladder rides get riders used to elevated structures. Leaving the Vortex, we took the Twister trail back to hit the Santos area. Twister is listed as a “more difficult” / intermediate trail on the map, and at first I thought this to be misleading. Granted, there were plenty of whipping turns (hence the name) to practice cornering, but once I picked up speed I understood. Riders in the Pacific Northwest know what it’s like to try cornering on slick, off-camber roots. 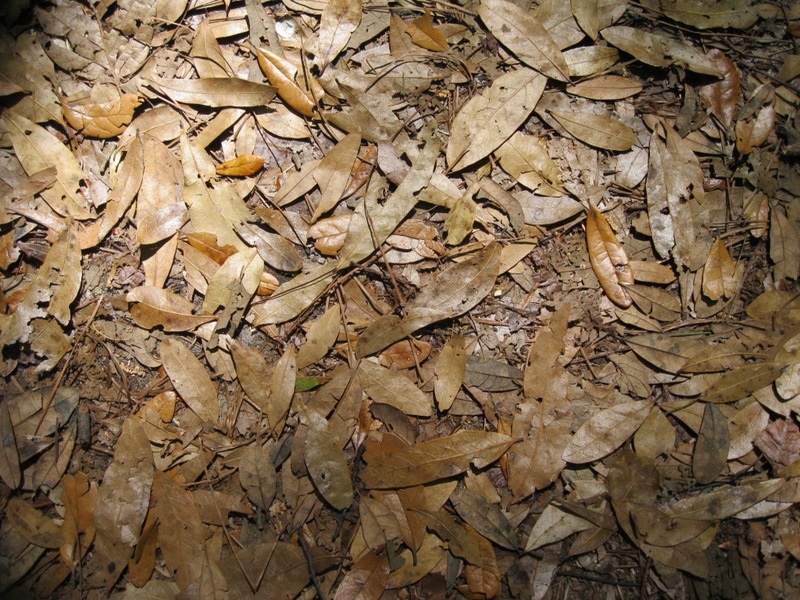 Well, the bane of southern riders must be the thick, loose layer of oak leaves, which cause your bike to “float,” or slide out when you’re trying to hold your line in the turn. The remedy: aim for any patch of dirt to find traction. Who knew that leaves were skill-building? Get used to riding terrain that moves. All the trails are all well-marked, thanks to OMBA. There’s also a handy map you can download from the OMBA website (www.omba.org) to keep your bearings. Trailhead signs and gateway features remind riders to ride with caution. As a rider who has little to no sense of direction, I always appreciate a map and good signage. I also value OMBA’s cautionary signs, such as the one above. Gateway features and explicit messaging are essential when your trail system is designed with progressive skill development in mind. Of course, if you’re visiting from out of town, you may have to put the Santos/Vortex XC technical difficulty scale in context. (Trails marked in red on the OMBA map are listed as black diamond or double-black diamond level; blue are intermediate; yellow are easy). These technical distinctions are consistent across the trail system and coherent taken together—just don’t expect the Santos’ “expert” XC level to match up with Whistler’s. This is Florida, after all. 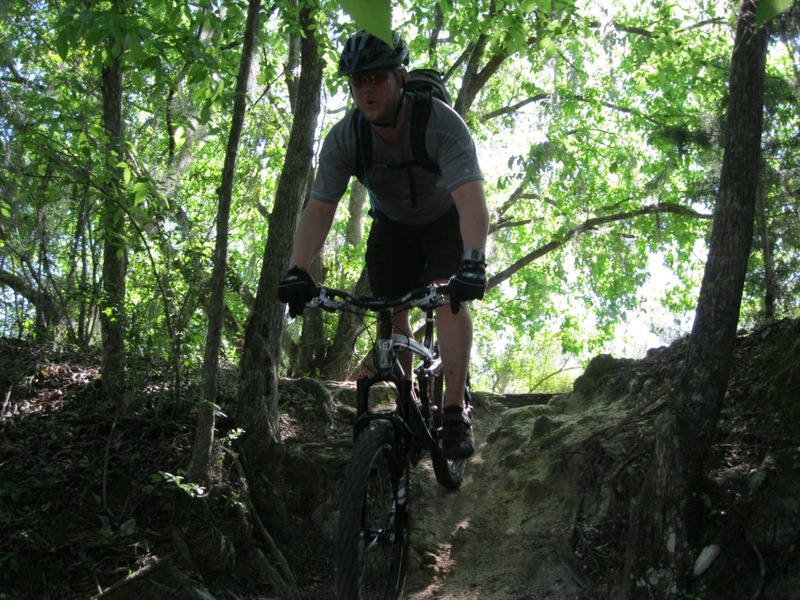 The “red” trails, such as the Vortex Loop/IMBA Red, John Brown, Rattlesnake Ridge and Magic Mountain, are challenging for their sudden, steep climbs, their variable terrain (including rock gardens) and some advanced features. 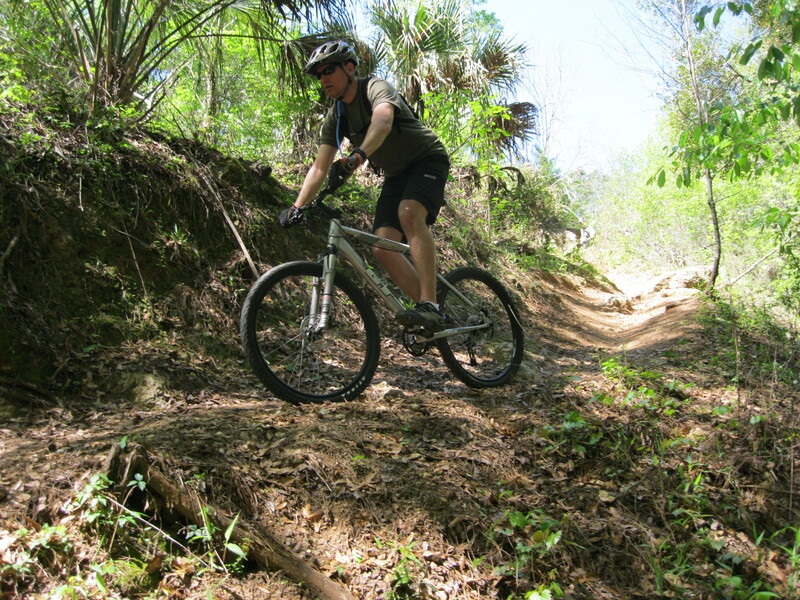 Intermediate trails at Santos, on the other hand, tend to be long, flowing, flat singletrack with the occasional rock, root or sharp turn to keep you on guard. 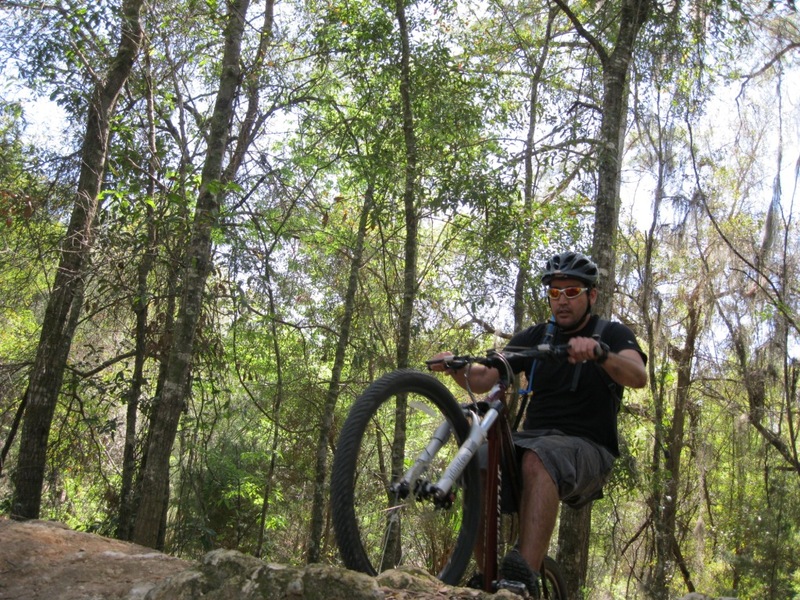 Jimmy gets steep on a rock-and-root descent. Jungle riding, with hanging vines and huge fronds all around. Final push to the top at the end of the John Brown trail. 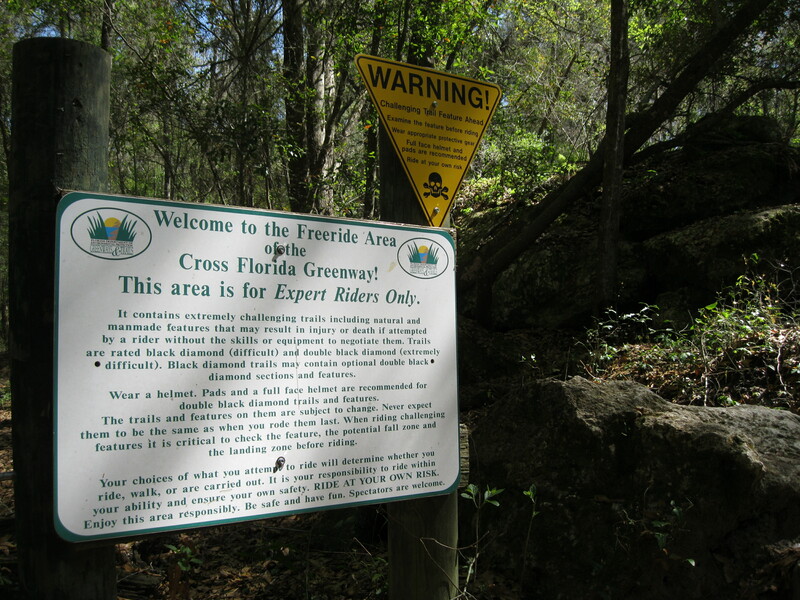 During my visit to Florida, I was thrilled to see how the Cross Florida Greenway Santos Trail System is helping build up the mountain biking community in the ostensibly mountain-deficient State. 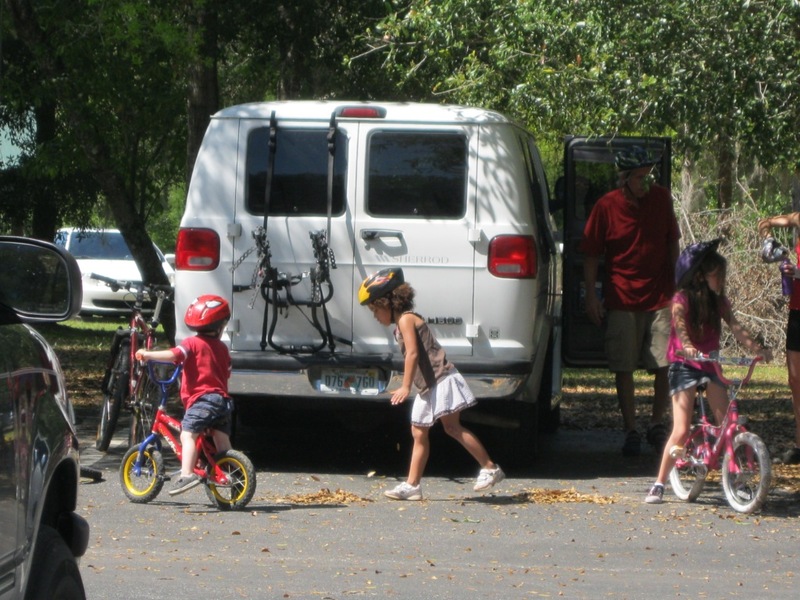 I saw many young kids—the next generation of riders—at both the Santos and Vortex trailheads. 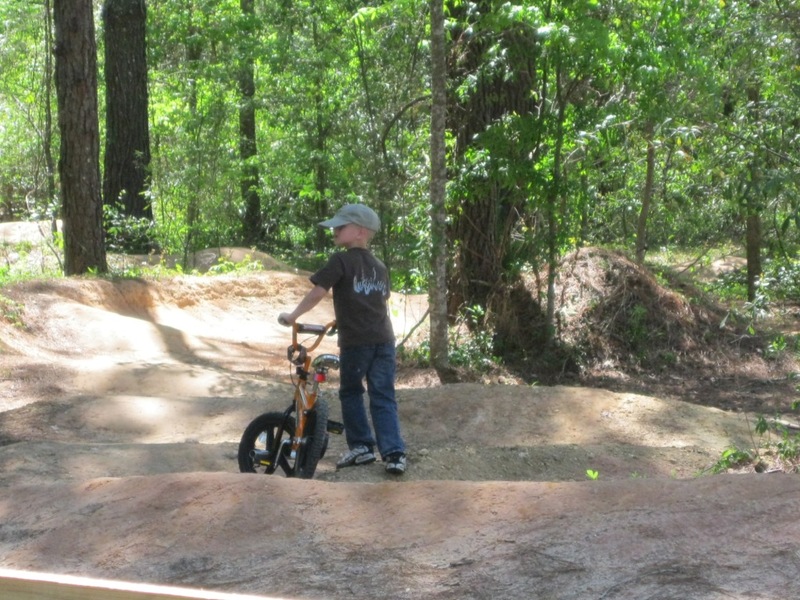 Some looked like they were getting their tires dirty for the first time; others were already schooling older riders on the pump track and dirt jumps. A young BMXer takes his bike out for a run. A great place to take the kids. 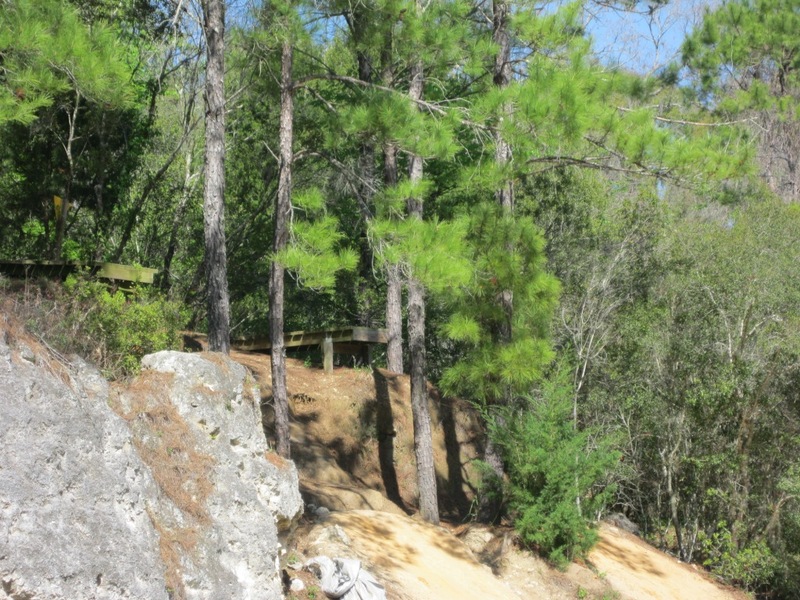 Directions to Santos Trailhead (3080 SE 80th St, Ocala FL 34480): Ocala is just under an hour and a half drive northwest of Orlando. From Orlando, take the Florida Turnpike/Ronald Reagan Turnpike north, merging onto I-75 N. Take exit 341 (Marion County 484) toward Belleview/Dunnellon. Turn right at County Hwy 484. Turn left at SW 16th Ave. and then turn right at SW 107th Pl. Turn left at County Road 475/S Magnolia Ave. Turn right at SE 80th St. and follow to the Santos trailhead parking lot. There is paved parking, picnic areas, restrooms and camping nearby. Directions to Vortex Trailhead (9150 SE 25th Ave, Ocala FL 34480): From Country Road 475/S Magnolia Ave, turn right at SE 95th St/Co Rd 467 and then right again at SE 25th Ave. 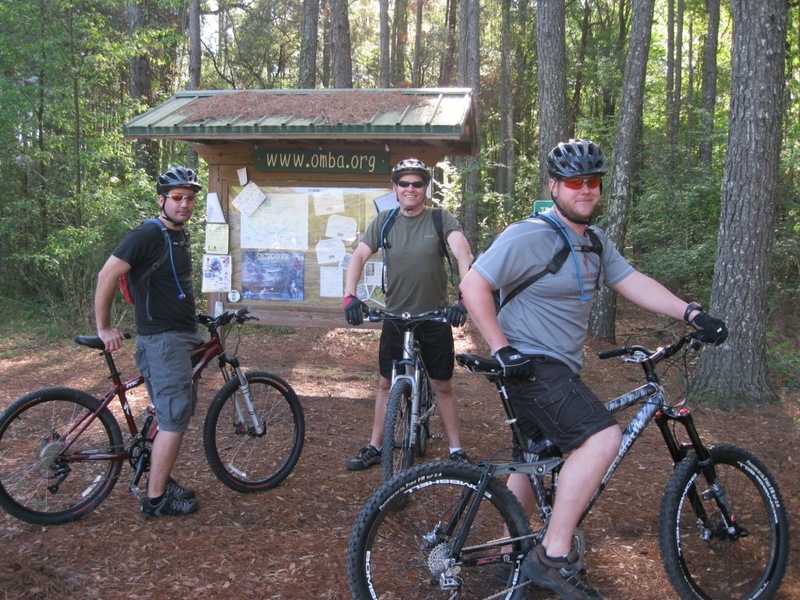 This entry was posted in Biking, Florida and tagged Cross Florida Greenway, Mountain Biking Florida, Ocala Mountain Biking Association, OMBA, Santos Area Trailhead, Vortex Area Trailhead. Bookmark the permalink.